Under-the-radar agency helps exclusive schools raise hundreds of millions of dollars– all while public schools scramble. This article was published Feb. 5 in Our Town, Our Town Downtown and the West Side Spirit. A little-known program within the city’s Economic Development Corp. has become the chief vehicle by which private schools in Manhattan refinance their capital projects, funneling hundreds of millions of dollars to some of the priciest schools in the city. In 2013 alone, the Build NYC Resource Corp. brokered more than $439 million in low interest, tax free bonds for 24 private schools in Manhattan. The schools use this money to pay down prior debt they incurred from bonds they took with the city’s Industrial Development Agency and commercial banks at higher interest rates, money they used for their initial expansions.A little-known program within the city’s Economic Development Corp. has become the chief vehicle by which private schools in Manhattan refinance their capital projects, funneling hundreds of millions of dollars to some of the priciest schools in the city. 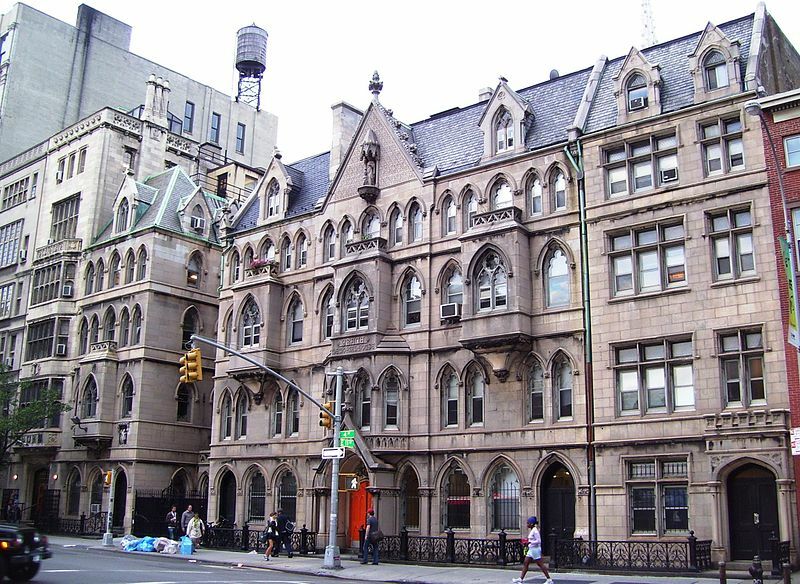 On the Upper East Side, schools such as the Spence School, the Chapin School, and Convent of the Sacred Heart School have secured millions in low-interest bonds for their capital projects. On the Upper West Side, the Calhoun School received a bond of $34 million and the Studio School got an $8.8 million bond. Downtown, the Grace Church School used $40 million in city-brokered financing to cover expansions they made in 2006 and 2011. The city’s rationale for the program is that when these private schools expand, they create jobs and additional tax revenue for the city. BNYC’s stated goal is to act as a “conduit-bond issuer,” setting investors – banks – up with not-for-profit entities that use the money for capital projects, which ultimately, the city says, will provide increased jobs and tax revenue. Through a spokesperson, the EDC said that BNYC merely acts as a conduit, or access point, for private schools and other entities to secure low-interest bonds, and the city does indeed benefit from such deals. “Build NYC is not loaning the city’s money capital,” said the EDC spokesperson. But the prevalence of exclusive private schools in these bond deals has some public school proponents wondering why the city is diverting resources to help these schools – many of which come with $40,000-a-year tuition – in the first place. Shino Tanikawa, president of the District 2 Community Education Council, learned of the program just as her Lower Manhattan district is bracing for a shortage of 1,000 elementary school seats. Private schools are not the only not-for-profits that BNYC helps with refinancing. The corporation has also brokered favorable bond deals for organizations like the American Red Cross and the American Cancer Society. One such bond was issued last year to the Lower East Side Tenement Museum in the amount of $8.9 million. But given the strains in the public-school budgets, it is the school financing that is likely to raise the most eyebrows. Grace Church School, for instance, secured a $40 million bond last May that it used to cover two previous bonds for expansions in 2006 and 2011. George Davison, head of the school, said the availability of these bonds is generally known in the private school community, and that it made more fiscal sense for the school to issue a bond through BNYC than to stick with the terms of their two original bonds. Davison said that during a two-week period in 2008, the flexible interest rate on the IDA bond whipsawed from 1 percent to 9 percent. While that swing is an aberration connected with the 2008 financial crisis, and it may be impossible to tell how much revenue the IDA bonds would have ultimately brought in, projections for that revenue seem non-existent in records kept by BNYC. In the case of the Birch Wathen Lenox School on the Upper East Side, which is in the process of securing an $8 million bond to refinance money it used to expand in 2004, the city estimates the school will generate $9.1 million in tax revenue over the course of a 15-year term. “So yes, this is in line with the mission of promoting economic and community projects, and it is not a ‘handout’ to a wealthy school,” said an EDC spokesperson. Tanikawa said she’d like to see some way in which public schools benefit from the city’s brokerage of finance deals to private schools. This entry was posted in News and tagged Birch Wathen Lenox School, Build NYC, Community Education Council, Economic Development Corporation, EDC, Education, education funding, Grace Church School, manhattan, private schools, public schools, school loans, Shino Tanikawa. Bookmark the permalink.